The C-47 is one of the simplest and most commonly used tools in lighting, grip and other film crew departments...and yes, it is a clothes-pin. The most common use is to clip gels or diffusion material to hot lights. The wooden construction is very heat resistant when applying to hot lamps and the steel spring provides plenty of holding strength for the gel materials to be safetly clipped. C-47s are also commonly called 'Bullets' or 'Pins'. 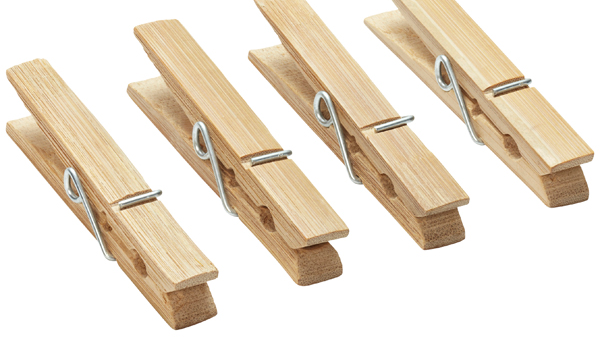 The story surrounding the re-naming of the common clothes pin to the iconic film industry nick-name of C-47 is a contested discussion. Most commonly sharred story is of a producer that was asked to purchase a very large quantity of clothes-pins for a produciton. For some reason the producer refused to buy such a large amount of the common items. A person in a lighting dock at one of the studios is rummored to have changed the name of the items in an inventory list from 'clothes-pins' to 'C-47'. With the stigma of the commonplace clothing aide removed, the order successfully made it past the auditing eyes of the producer and the infamous tool now deamed the C-47 was available to work it's magic on-set. The reverse version of the C-47 is often referred to as the 'A-47' or the 'reservse bullet'.